Ivy league commits, Ben Hartvigsen (Harvard) and Jonathan Reid (Dartmouth) went one and two for Florida boys in the Championship race. Hartvigsen finished 14th in a time of 15:31 -- a ten second improvement from last year's race in very rough race conditions. Coming off his 4A runner-up finish two weeks ago, Reid, ran a time of 16:00 to finish 41st. Reid ran a 15:59 last year, but this performance takes the cake on one of the most impressive runs of Reid's season. If you were at Foot Locker or NXN this weekend, you were well aware of the rainy and frigid temperatures that these athletes were racing in. The fact that these runners ran times in close proximity to their PRs is very impressive. Nehemiah Rivers continued his breakout season with a 16:02, 46th place finish. He was followed by Junious (Jay) Brown who went 16:08 to finish 61st and Angel Vicioso who ran 16:09 to finish 63rd. Jackson Pruim and Anderson Denton capped off Florida's top seven with their 16:12 and 16:13 performances. Nickolas Kamen represented the state of Florida well with his speedy 16:21, third place finish in boys senior race. Kamen ran a time of 16:47 at the FACA All-Star Classic and a 16:13 at the state meet before. This was a great performance for the Gulf Coast senior as he heads into his final track season. Gabriel Ortega and Alec Latzke went second and third for Florida boys with their 16:48 and 16:50, 12th and 15th place finishes. Ortega was just shy of his 16:40 performance at the state meet two weeks back, a strong season finisher for the Pine Crest senior. Hunter McAdams ran fourth for Florida and captured a sub 17 minute time with his 16:59, 28th place finish. 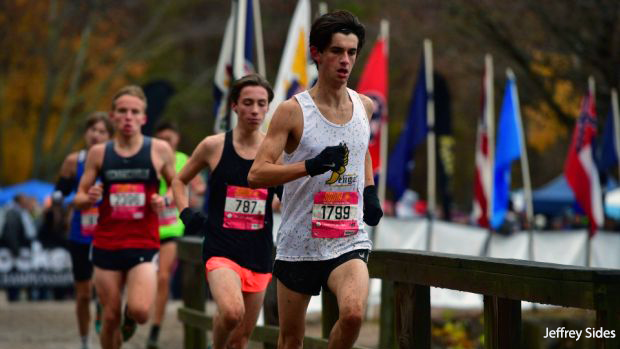 Alex Fiorillo and Sarasota duo, Alan Romero and Anthony Bilotta finished out the Florida pack with their 17:11, 17:17, and 17:18 performances. Gavin O'Brien and Lewis Benitez brought it home for the Florida boys with their sixth and seventh place finishes. O'Brien ran a time of 16:23.33 with Benitez right behind in 16:23.33. Great season ends for these juniors. Dylan Nelson finished third for Florida with his 13th place, 16:33.16 finish -- improving on his 16:33.64 finish at the state finals two weeks back. Nelson has consistently run 16:33 on a variety of courses this season and will look to a strong track season to break the 16 minute barrier come senior year. Kai Cheatham and Joshua Kraver finished fourth and fifth for the Florida boys, with ten seconds separating them. Cheatham ran a time of 16:42 to finish 22nd with Kraver behind in 16:52. One second separated the sixth and seventh Florida guys in the Junior race. David Keen finished 45th in 17:08 with Owen Taylor capping off the team in 17:09..
Wynne Thomas brought it home for the Florida boys with his win in the Sophomore race. The Plant sophomore ran a PR of 16:10 at the state finals two weeks ago to finish in a very strong seventh place. Thomas ran 16:17.75 to lead the sophomore field by 3 seconds. Thomas has improved since his freshman season by 46.16 seconds! Coming off a state team title, Orlando Cicilioni, ran a time of 17:03 to be the second Floridian sophomore to cross the line. Liam Holston was five seconds behind Cicilioni with his 17:08, 38th place, finish. Zachary Harrigan finished fourth for Florida in 17:14 with Aiden Arnold right behind in 17:17. Harrigan bettered his state finals performance by nearly 20 seconds with a season best. Famous Rhodes ran a time of 17:21 to place 53rd and race his way to the sixth Florida boy and Alex Bagby capped off the team with his 17:44, 90th place finish. Florida's freshman showed us that the future is very bright. The Florida boys put their tip seven in the top 24, with their number eighth coming in at 25th place. Leading the way was Matthew Stratton, who finished third place in a time of 16:44. Stratton has had one breakout season -- starting the season off with an 18:29 performance down to a 16:19 at the state finals two weeks ago. Ryan Maney was Florida's number two, finished in 16:49 for sixth place. Jessie Benavides and Steven Cartwright represented Jacksonville well with their ninth and tenth place performances -- Benavides running 16:56 and Cartwright, 17:08. Ethan Lipham was Florida's number five in a time of 17:16. Kolton Pickard (17:26), Ashton Stringer (17:32), and Colsen Palmer (17:32) brought it home for the Florida freshman. With times like these and with strong track seasons ahead of them, we are sure to see these names on top returners come 2019. Florida's freshman are fast and so are the 2019 upcoming freshman. Most of these middle schoolers are not used to racing the 5k distance here in Florida, but they sure showed the state that they have the training and strong ability to race the distance. Jack de Jesus brought it home for Florida with his fourth place, 17:28, finish. De Jesus has had a very strong season, racing the 5k a few times, and winning the flrunners.com Invitational middle school race back in September. Middle School State runner-up, Riley Novack, finished second for Florida with his eighth place, 17:38, performance. Braxton Legg (17:53), Caden Montini (18:06), and Matthew Raucci (18:17) capped off the top five for Florida boys. Hunter Morgan and Will Hartvigsen finished sixth and seventh with for Florida with their 18:43 and 18:58. This group of boys will be ready for strong high school seasons come next year. John Keester finished strong for the Florida 11-12 year old boys with his 10:59 performance to finish 14th. Keester was followed by Connor McCarthy (12:01), Marcus Jayden Fuller (12:41), and Alex Butler (12:49). Brock O'Brien capped off Florida's top five with his 54th place, 14:12 finish. Great finishes by these young athletes as they close off their cross-country seasons and get ready for middle school track.